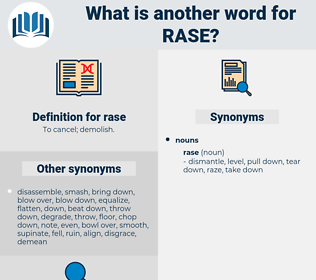 What is another word for rase? set up, erect, rear, raise. If I rase and cut hair, I starve myself, but if I make myself of great use to all around, I grow rich. Tell her, that he who made thee, years ago, By northern stream and mountain, and where blow Great breaths from the sea - sunset, at this day One half thy fabric fain would rase away; But she must take thee faults and all, my Verse, Forgive thy better and forget thy worse. 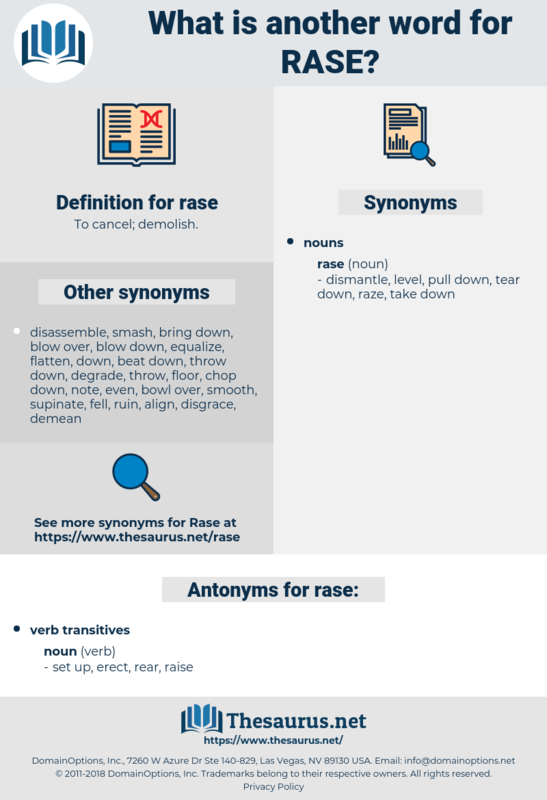 rask, recuse, razz, reek, roughish, raucous, rye whiskey, ras, roc, ragusa, risc, rockies, ray's, rosaceae, rosaceous, rakish, rye whisky, reuse, reissue, rose, RG, rescue, reggae, roguish, raj, row house, rhesus, ross, r.c., res, Rya Rug, raise, rage, ricksha, recce, ruck, raze, rorschach, riga, rhus, rhexia, rico, rick, rice, recess, rake, rough-house, rusk, risk, rehouse, rockchuck, roccus, resize, rickey, rig, raja, roughage, roseau, rock, raree-show, rehash, Rus, rejoice, risky, richea, riches, rough-hew, rag week, rag, reassess, ragi, rush, rachischisis, rejig, rioja, recco, racy, re's, re-echo, reach, ruga, rouse, ruscus, rehearse, rouge, resew, rose acacia, resh, rookie, risque, rush away, ruckus, re-argue, ragee, rug, reccy, rosa, russia, rogue, RAYS, rousseau, rous, rocky, Reyes, rickshaw, rajah, ruse, rack, rosacea, ruscaceae, Rex, rugose, rissa, reecho, rich, reich, roux, rock cake, roach, rough, rook, rise, rococo, rucksack, rachis, rework, race, rash, ross sea, roughhouse, rosy, raceway, reseau, rushy.